The lid for this antique cut glass powder jar was very badly damaged. It had dents all over, top and sides. Removing the dents takes time, patience, and skill. I need to slowly push out the dents rubbing them out gently with steel tools avoiding any further damage. Then the silver is burnished and polished looking for imperfections. I do this over and over until the silver is blemish free. Below you can see this lid repair in progress. In the photo (right), this is the lid after an hour of gently pushing out the dents from the inside. The inside of the powder jar lid was gold plated so I was working very carefully to avoid damaging the gold plating. The next photo (right) shows great progress after two hours, The first one or two hours removes most of the dents, but the real level of perfection is only after three or four or five hours of pushing from the inside, and then burnishing on the outside. I gently polish the exterior so that even the slightest imperfection will show. Then I can renew my efforts towards the final restoration. There are many more hours to go. 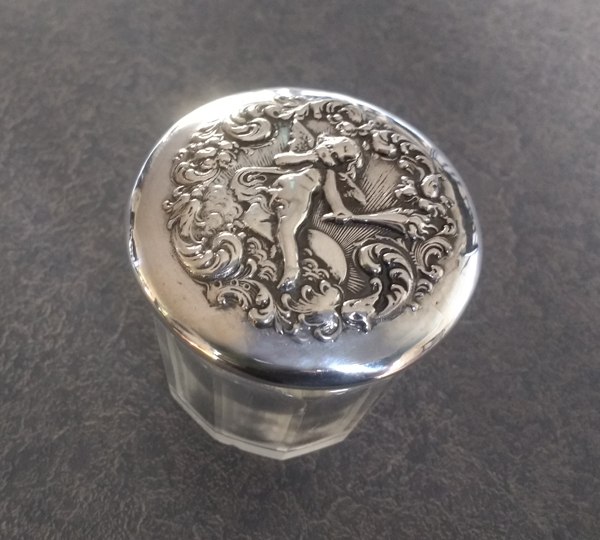 This sterling silver powder jar lid had a sharp dented crease across the top. Sharp dents are the most difficult to remove, but I was able to make in completely disappear and remove all the small dings in the top. This was a difficult repair. The right side of the lid was so crushed that I would swear it had been stepped on. It was extremely difficult to push this back into place without damaging the elaborate design on the top. 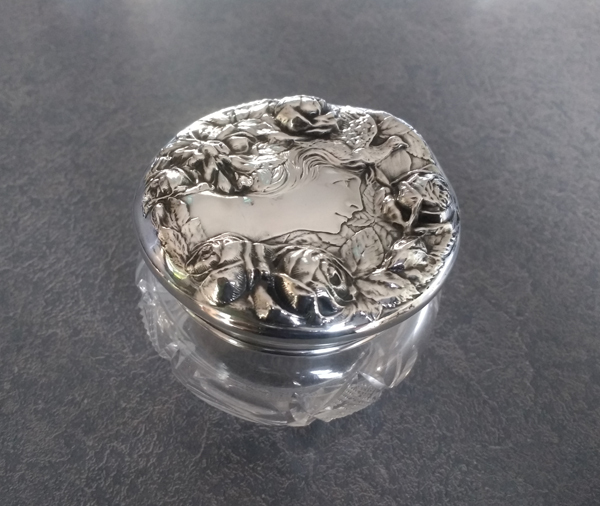 Sterling silver powder jar lids seem to arrive with a lot of dents and dings. A sharp ding is much harder to remove that a soft pushed in dent. I avoid using abrasives to removed the dents and dings. imperfections are pushed out from the inside without damaging the gold plating, and then burnished with highly polished steel on the outside. This takes hours and hours for one powder jar lid working on the inside and then the outside. A light polish and it is finished. 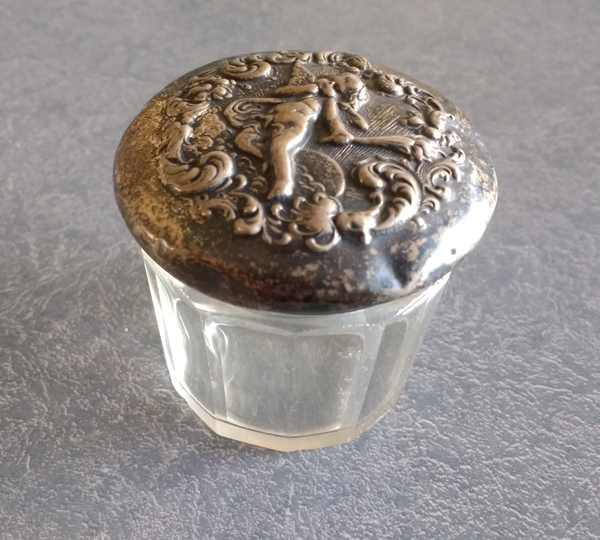 This Foster Bailey sterling silver powder jar lid with a Victorian Lady as a major feature arrived dented all around the edge, but the worst area (at the top of the ladies head) was pushed in on the side. The image of the Victorian lady was also pushed down (left photo.) After working on the lid for many hours it looks completely restored to original condition. I do not use abrasive tools or polishing which makes the metal thin, instead, I am pushing out the dents and burnishing the silver on the outside. Contact me through my website to send me photos of your dresser set lid for repair.